Have you ever awakened and looked in the mirror, only to find that your eye is swollen? Or has your eye developed swelling throughout the day? Why is my eye swollen? is one of the most common Google searches related to eye conditions. That is because it’s a condition that has multiple causes and can arise for all kinds of reasons. One of the scariest things that can happen in association with swollen eyelids is when the eye swelling is so severe that it prevents the individual from seeing clearly. First of all, if you are experiencing that level of swelling around your eye and you do not know the reason (i.e. you haven’t had a direct physical injury, for example), then you should definitely consult with a doctor. Consulting with a professional ophthalmologist or an optometrist is one of the easiest ways to identify exactly what may be causing the swelling around your eye. Asking a professional is the best way to get a personalized answer that is in line with your particular medical history. All that being said, here we will explore the various symptoms that can indicate that you have a swollen eye or eyelid and what underlying conditions could be causing those issues. Finally, we’ll discuss the treatments and options for individuals who are experiencing swollen eyes. Before your eye swells, you may have some preliminary indications that the irritation is developing. For example, itchy or scratchy eyes. 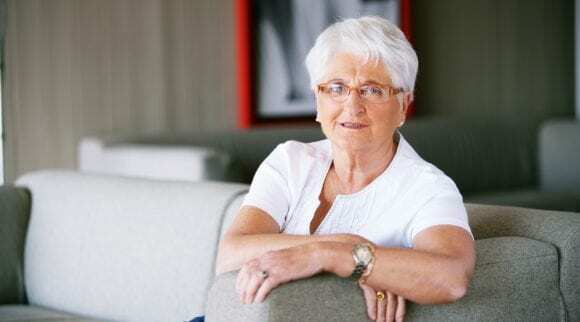 Sensitivity to light, also known as photophobia, is another preliminary indication that your eye may swell soon. Another symptom that commonly accompanies swollen eyes is excess tear production, causing your eyes to water. 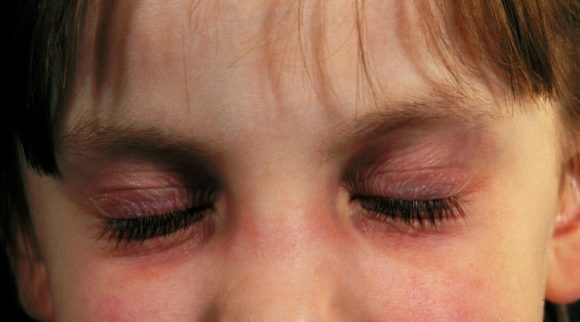 Often, when the eye is swollen, there is redness around the eyelid as well as on the eyeball. There can also be inflammation of the conjunctiva. The conjunctiva is a mucous membrane that covers the front and the inside of the eyelids. 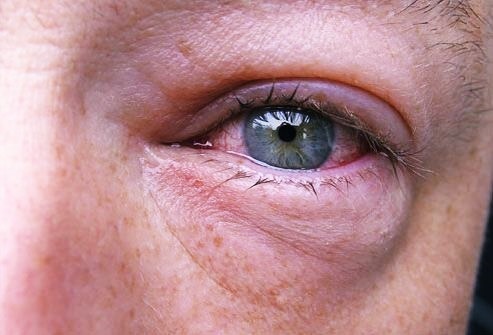 Other symptoms that can arise alongside a swollen eye include eyelid dryness and flaking, as well as eye discharge. The discharge can be yellow and dry, crusty, or more wet. And of course, there is often pain and discomfort associated with swelling. This is not always the case, however. Finally, a swollen eye can take many forms. The swelling could occur above or below the eye ball. It can cause puffiness underneath the eye, or it can swell on your upper eyelid and threaten your vision. Technically, swelling around the eye is what happens when there is excess fluid in the tissue around the eye. This excess fluid is also known as edema. Many individuals complain of puffiness around the eye, but it is slightly different than your eye being swollen. Puffy eyes can simply be a slight bloating around the eye skin. It can arise because of fatigue or genetic factors, or because of water retention. The following is a list of conditions that you want to look at because they commonly cause swollen eyes. The most common conditions that cause your eyes to swell include a variety of diseases, some environmental factors, and some common behaviors. A stye is also known as a hordeolum. A stye typically presents as an itchy and painful lump on the eyelid. Depending on how quickly it develops, a stye can begin to look like a pimple on your eyelid over the course of a day or a week. The stye can eventually form a white head, similarly to a pimple. Styes are caused by infections of oil glands and/or tear glands that are found at the base of the eyelids. Typically, these infections are localized and don’t require external treatment. You can reduce the swelling and pain associated with a stye by applying a warm compress and keeping the area clean. Sometimes, a stye can be so problematic it requires antibiotics in order to treat it. You should consult your doctor if you have more than one stye at a time and/or are experiencing extreme pain in association with your stye. 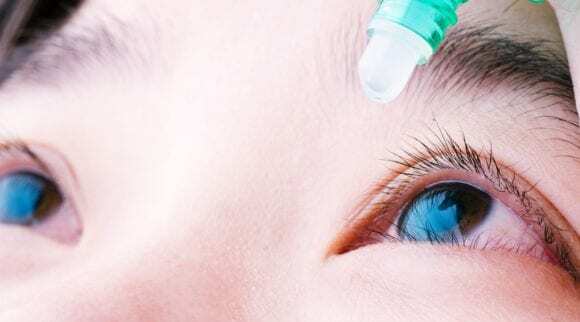 If your vision ever becomes impaired or you develop a fever, you should also receive antibiotic treatment. Styes and chalazions are often confused for each other. That is because they can present very similarly. Chalazions also appear as bumps around the eye. 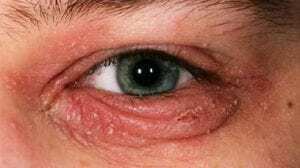 The central distinction between a stye and a chalazion is while a style is a bacterial infection of the glands around the eye, a chalazion is when the glands are simply clogged, and this may not be due to an infection. Another feature of chalazions is that they rarely hurt as badly as styes. Although, the bumps caused by chalazions can grow to be quite large. This can make it difficult to see, which can be quite anxiety inducing. Another issue that arises with chalazia is that often if you have one, you will probably get more in your lifetime. Typically, these bumps resolve on their own, and are similar to styes in that they can be treated at home with warm compresses. If this is not what happens to your chalazion, you should consult your doctor. Blepharitis is a generalized term for a condition of increased bacteria around the eye and eyelid. It indicates an inflammation of the eyelid that can be prolonged. This condition can cause the development of both chalazia and styes over time. 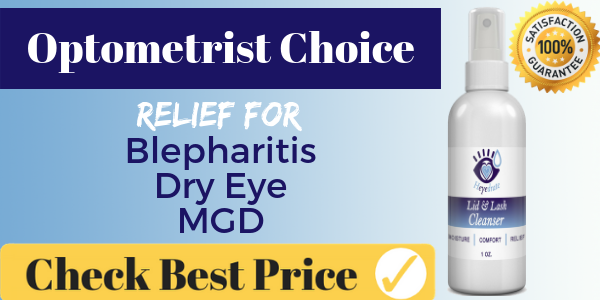 Blepharitis causes swelling, as well as dry eyes, irritated eyes, and dry eyelids. There is no known cure for this condition, but there are many treatment options. Individuals with this condition can try a variety of products on the market. Often, individuals with this condition experience flares, where the pain or irritation is very intense followed by less serious symptoms, or periods of no symptoms at all. There are eyelid cleansers that include antibacterial properties to reduce the issue of blepharitis. These products can use a variety of chemicals as well as natural ingredients to reduce the bacterial content around the eye and keep it clean. Other treatments include moisturizing the eye area, careful cleansing of the eye and eye area, as well as eyelid scrubs. When you visit an ophthalmologist or an optometrist, they may prescribe you antibiotics or ointments that can be helpful. This condition is best treated through experimentation with the treatment options until you find what works best for you. Another major factor that can cause inflammation, pain, and swelling around the eye is a bad reaction to cosmetic products. Depending on the particular ingredients of these products, cosmetics can be a huge contributor to problems you have with your eyes. If you are having issues with your eye swelling and you typically wear eye makeup, it’s good to consider stopping your routine and seeing if the swelling is reduced. Sometimes eye-whitening drops can be particularly problematic. Depending on the chemical compounds in the make-up or drops you are using, a serious reaction can occur. Even if you don’t typically wear eye makeup, other products that you put on your skin or face could be causing issue with your eyes. Especially if your eyes are itching, you may inadvertently be touching your eyes with your fingers and getting other beauty products into the eye area. Besides beauty products and cosmetics, more general allergies could be causing your eyes to swell. If you are used to having seasonal allergies, then you know that during certain times of year you can expect to experience watery, swollen eyes, perhaps alongside sneezing and congestion. Common allergens include dust, pollen, and other air pollutants. Even if you have never experienced allergic reactions before, you could still be having an allergic reaction. Allergies can appear suddenly in someone’s life–it’s not necessarily a condition you are born with. Of course, the best treatment to prevent allergies is to avoid the allergen. Sometimes this is easier than others, but there are also many treatment options. Over the counter medications that are antihistamines can be a powerful way to combat allergic reactions. Or, you can visit your doctor. Specialized medical professionals can give you tests to determine exactly what you may be allergic to. Through this testing, they can provide you with prescriptions to help you with allergies. Any trauma to the face or eye area can cause serious eye swelling. If you had a physical trauma like this, you are probably not wondering why your eye is swollen, but we’ll cover it anyway. Surgeries, like cosmetic surgery or eyelid surgery, can trigger very difficult injuries. This kind of swelling and inflammation is best treated with warm compresses and rest. If you have any concern about your vision or you are not seeing the eye area heal at the same rate as the rest of your injury, it’s a good idea to visit your doctor. Reflex tears are the tears that are produced when we have something in our eye and our eyes are working to flush out the irritant. This can happen if your eyes are exposed to toxic smoke or other irritants. Basal tears are the tears that are always being produced and then applied by blinking over the entire eyeball to keep them moisturized as they are exposed to the air. Emotional tears are the kind that are created when you are feeling sadness, pain, or grief, or even happiness in some cases. When you are experiencing these kinds of tears, the glands that produce your tears are put into overdrive, as there is a constant streaming of tears associated with crying. This excess moisture is then absorbed by the skin around the eyes, which is what causes the swelling of the eyes. The longer you cry, the more swelling you will experience. This kind of swelling should resolve relatively quickly, again depending on the duration of your crying. In general, though, scientific research has demonstrated that crying can be a very positive and healthy reaction that has many other benefits, even though it does cause swelling. Orbital cellulitis, periorbital, and preseptal cellulitis are all terms to describe infections of tissues around the eye and eye socket. This infection could have started due to trauma around the eye, such as an insect bite. Another potential cause of this kind of infection could be a sinus infection. Orbital cellulitis is the most serious of these conditions, and it describes an infection of the eye socket. 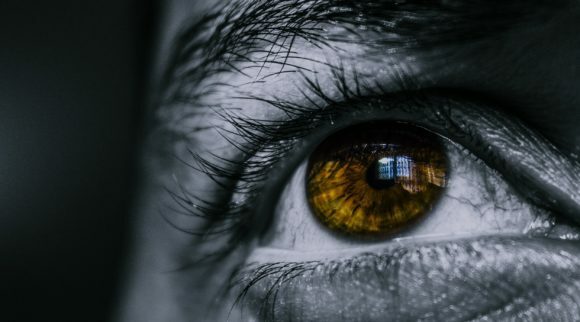 Once an infection has reached your eye socket, it can cause permanent vision issues by causing an infection of the optic nerve and further back into the brain. That’s why it’s vital to visit a doctor if you think you may have some kind of cellulitis of the eyelid. The painful swelling that accompanies cellulitis can also cause vision to be impaired. In serious cases, you may not be able to open your eye because the swelling is so severe. This kind of deep infection is caused by bacteria. This can happen if you have an injury to the skin around the eye, like a scratch. This kind of minor injury can become a major infection if not treated properly at the start. As long as you address the cellulitis quickly, this condition is typically easily treated through antibiotics. It’s important that after you receive antibiotic treatment you do not reuse any of the eye cosmetics or contact lenses that you previously used when you had the infection. That’s because these personal items can still harbor the infection and can even cause it to return. This is a virus that is part of the type 1 herpes simplex virus. This viral infection can reoccur often. The disease is sometimes called “a cold sore of the eye”, and it appears similarly. Small red bumps can appear around the skin of the eye. It can also cause scarring of the cornea, as well as inflammation and swelling. There are three types of ocular herpes that describe how in-depth the viral infection is. The three types are stromal keratitis, herpes keratitis, and iridocyclitis. Stromal keratitis is a deep infection into the layers of the cornea and can cause blindness and scarring. Then there is herpes keratitis, which is a viral corneal infection. It tends to infect the epithelium, which is the thin top layer of the cornea. And then there is iridocyclitis, a more serious form of ocular herpes. This is when the areas around the iris and tissues near it become inflamed. This can cause serious issues with your vision and is more difficult to treat. Like other herpes infections, ocular herpes can flare up at various points, called outbreaks, and can vary widely in terms of severity. There are a variety of treatment options for these outbreaks. There is an FDA approved topical antiviral that is often prescribed, but oral antiviral medications often work more effectively at a more reasonable cost. Graves’ disease is a serious autoimmune condition. An autoimmune condition is a condition when the body’s immune system attacks healthy tissues in the body as if they are foreign invaders. Graves’ disease indicates the immune system is attacking the thyroid gland. This causes the thyroid to increase production of hormones, which increases the metabolism. There are a lot of difficult symptoms associated with this disease. The eyes are one of the most vulnerable organs to the disease. When Graves’ disease manifests in the eyes, it’s called thyroid eye disease. This is because the tissues in the thyroid gland have similar proteins to the tissues in the eye muscles and eye socket. This disease can cause increased pressure in the eye socket due to the bulging of tissues behind the eyeball. There can be very intense headaches and even migraines associated with this pressure. Eventually there can be swelling that puts pressure on the optic nerve. 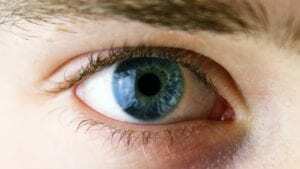 The eye muscles can become damaged by this autoimmune disease. It causes them to lose elasticity, which can cause the bulging that is a telltale mark of this disease. It can also cause patients to appear to be staring intently. Eye movements can also become restricted. Individuals with this condition have a variety of treatment options and can usually maintain their vision through careful treatment. Like all chronic conditions, there is always the possibility of an additional flare up of Graves’ disease. But many individuals with the condition go on to have little to no vision problems as long as their thyroid issue is managed. 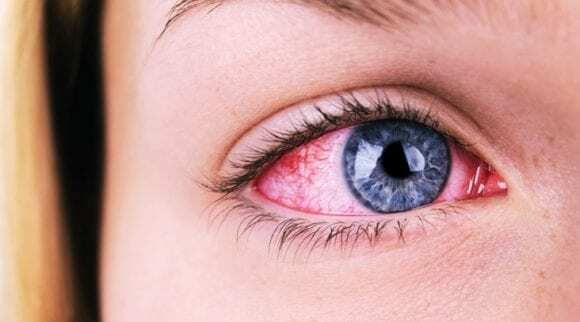 Conjunctivitis is a common condition that can take on both a bacterial or viral form. It is usually easily treated. It is often associated with profuse mucus and discharge coming from the eye. It can be especially thick in the morning, sometimes even preventing the eye from opening. It’s important to keep the eye clean and clear of any beauty products or cosmetics while you are healing from conjunctivitis. Another great treatment for this condition is applying warm compresses onto the eye area. It’s important to keep your hands clean by washing them frequently so you can keep the infection in check and not spread it to others. Typically, these infections can resolve on their own through home treatments. A great way to reduce the pain associated with this infection is by applying warm compresses. 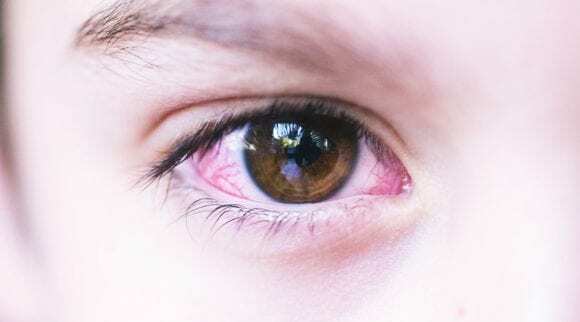 Throughout the time that you are demonstrating symptoms of conjunctivitis, it’s important that you avoid rubbing or itching your eyes. If the infection does not resolve on its own, it’s a good idea to make an appointment with your doctor. Sometimes they will prescribe antibiotics or other medications to help the symptoms dissipate faster. 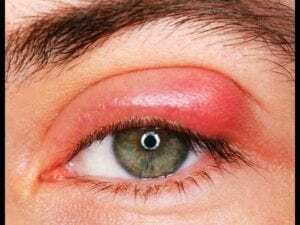 Another cause of eye swelling is bee stings or bites. There are many different kinds of stinging insects, and our bodies can react to contact with them in various ways. We may know right away when we’ve been stung, or we can be bit or stung and feel the effects afterwards. Because of this, bug bites can be a cause of swelling that can be somewhat sneaky. If you’ve been outside for a prolonged period or been in a new environment, it’s possible that you came in contact with an insect bite. If you were stung by a bee or a wasp on some area of your face, swelling can also occur around the eyes. Multiple stings can cause a reaction in the lymphatic system, which can then present in the eyes. There are a variety of treatments for bug bites, but because of the sensitivity of the skin around the eye and the eyelid, you have to be careful about which ones you use. A warm compress is also a great approach to treat bug bites. There is no doubt that swollen eyes is one of the most bothersome conditions that individuals can face. Swollen eyes can make it difficult to see or perform basic daily tasks and routines. There is often pain associated with the condition that can be difficult to overcome. Plus, it doesn’t look great. Truly, there is no worse irritation than when the eye is severely irritated. That’s why it’s important to know the treatment steps when you are facing this condition. Purchase a warm compress eye mask, like the Heyedrate Dry Eye Warm Compress, and heat it in the microwave for 20 seconds before placing over your closed eyes for 10 minutes. This can help break up any crust or discharge that may have formed around your eyes, eyelids, or eye lashes. This also helps reduce swelling. Many causes of swollen eyes are related to bacteria or other particles in the eye that should not be there. It’s very important to keep the entire area clean so that it has the opportunity to heal. Use gentle hypoallergenic cleansers with very few ingredients, such as the Heyedrate Lid and Lash Cleanser. This may be used two to four times per day for maintenance of healthy eyelids. Blinking is the most effective way to re-moisturize your eye. A lot of conditions that cause swelling are related to imbalances of moisture in the eye. That’s why blinking can be so effective to help heal the eye. It can also help remove oil from the glands in the eyelids. Clogged glands can be a big factor in perpetuating eye swelling. If your eyes are swollen or irritated, stop wearing your contact lenses. Reduce the amount of time you are spending looking at screens. You might also want to cut back on any beauty products or cosmetics that you are using on your face or skin. Sleeping with an eye mask can also help rest the eyes. If your swelling does not dissipate after one day of following these steps, and you aren’t sure what is causing your swelling, then it is a good idea to consult a medical professional. That’s the best way to determine the cause of your swelling and improve your condition. There are some steps you can take to reduce the chances of developing swollen eyes. One step is to make sure you are keeping your dandruff in check. Dandruff can cause issues with your eyes and even swelling. You can also use artificial tears or other drops to make sure that your eyes retain moisture throughout the day. That’s a great way to keep your eyes healthy. There are many foods that you can eat in order to improve your eye health. One of the most powerful nutrients that can help improve your eyes is Omega-3s. Omega-3s are found in fatty fish like salmon, tuna, or herring. This nutrient has been shown to improve or help decrease symptoms of blepharitis and dry eyes, and you can easily take Omega-3s in supplement form as well, such as the Heyedrate Omega-3 for Eye Health. Why Is My Eye Swollen? Clearly, this one question has many different answers. A wide variety of conditions, environmental factors, and diseases can cause your eyes to swell up. Sometimes, it can be difficult to determine the exact cause of the condition. It may take time to identify which particular factor is causing the swelling. From there, you can determine the correct course of treatment. But the good news is, eye swelling is rarely fatal or even dangerous. Equipped with the right information, and you are well on your way to reducing swelling!